I have a confession to make. I made zero New Year’s resolutions this year. And seeing how we are already six days into 2014 and I have barely left the house, I’m starting to think that maybe I should have. I have managed to make a to-do list a mile long, but that’s more clean the house and return some emails than save the world and change my life resolution worthy. I would like to start a Meatless Monday routine (or at least go meat-free once each week). I love vegetables but every time I think about vegetarian dishes, I think wow that would probably be better with some chicken stock or bacon. But for both our budget and I suppose for all those environmental reasons, I think we need to give it the old college try. I’ll let you know how long it lasts. Every year for Christmas, I get a stack of gorgeous cookbooks and immediately read them cover to cover. But then I rarely actually crack them back open. While I’ll never be a follow-the-recipe-to-a-tee kind of person, I would love to actually use my cookbooks more. I should vary my bread making. I can’t remember when the last time was that I baked anything but my basic bread dough. Forming it into a baguette vs. a flat bread doesn’t count. A few years ago, my dad bought a 50kg bag of bread flour at a restaurant supply store and gifted me a bag of flour the size of Gertie. I was making everything from sandwich bread to pitas to swedish rye. It’s time to get back to that. Going forward, I need to stay on top of cleaning the dishes. With the world’s smallest sink and sans dishwasher, I feel like they pile up in the blink of an eye. And honestly, most of the times that we do end up ordering take out it’s because I’m too lazy to free up the pot and knife needed to cook. That has to stop. It’s killing our waistlines and our budget. In the throws of one last Indian take-away order last night, Chris stated that he wanted salads for lunch all week. While, yes, we absolutely need to be eating salads right now, my problem with this is that it is cold and grey out – so I don’t want summery leafy greens with fresh crisp veg! But I do want soups and really simple meals with lots of vegetables. So this week, I’m going to focus on hearty warming bowls of winter goodness and dinner plates filled with 75% vegetables, 25% lean meats, and ZERO% fatty pastas and creamy potatoes. Over the weekend I made a massive plate of roasted kale and grilled up strip steaks with an awesome mushroom pan sauce. I could eat that every freaking day but even that is a bit fancy and indulgent. (Don’t worry I will be posting the recipe very soon.) 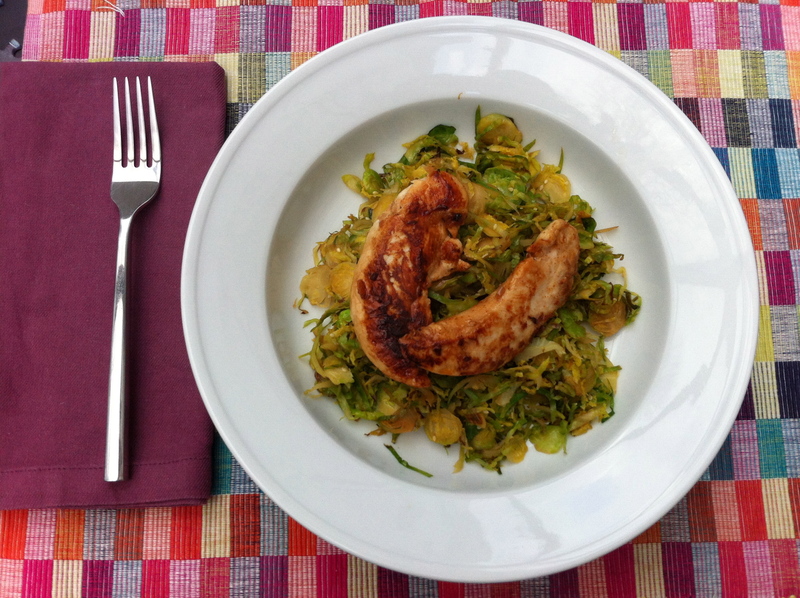 For a quick dinner try a sesame Brussels sprout hash with ginger soy chicken. 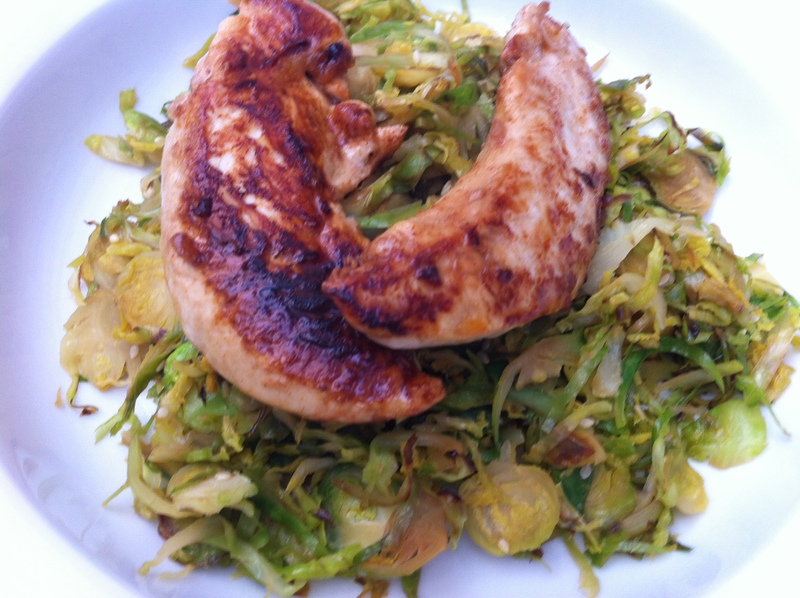 Cooking Brussels sprouts this way is one of my go to ways to convince haters to give them a try. You shred them into a thin hash and quickly stir fry with soy sauce and sesame oil. It’s such a simple way to transform this vegetable into a crowd pleaser. I made a simple marinade with soy, ginger, brown sugar, rice vinegar, and a pinch of cayenne for the chicken. 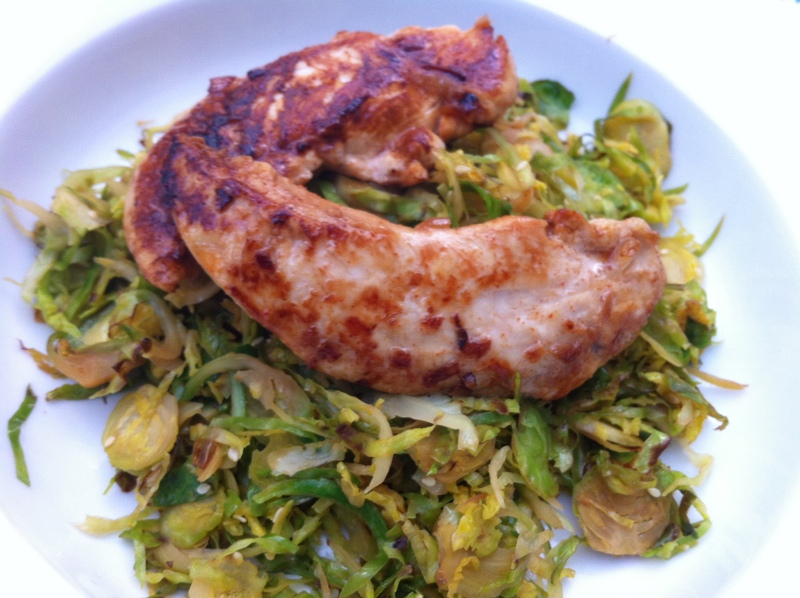 Then in an attempt to keep the dish duty to a minimum just pan seared the chicken in the same skillet I had used for the Brussels sprouts. The slightly spicy gingery chicken is the perfect complement to this quick asian hash. In a ziplock bag, or shallow bowl, mix together 1 1/2 tablespoons of soy sauce with the vinegar, ginger, brown sugar, and cayenne. Add the chicken and marinate for 1-3 hours. 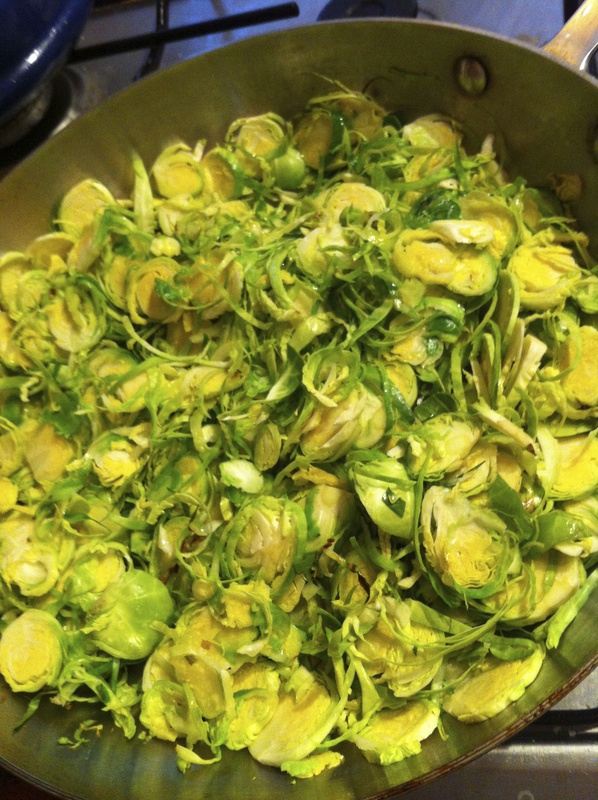 Thinly slice the Brussels sprouts, about six slices per sprout. Heat vegetable oil in a large skillet over medium high heat. Add Brussels sprouts and stir fry for 4 minutes until they begin to brown. Reduce heat to medium and toss with the remaining tablespoon of olive oil. Cover and continue to cook for one minute. Toss with sesame seeds and oil. Remove from skillet and keep warm. Add chicken to the pan and cook for 4-6 minutes per side, until cooked through. Serve atop the Brussels sprout hash. « What do you want, a cookie?